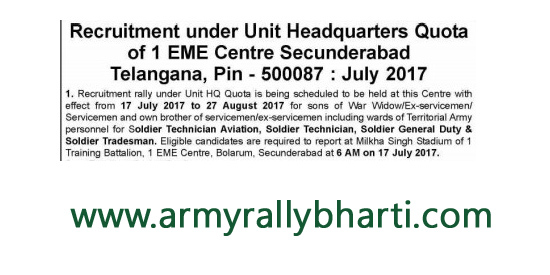 Relation (Bhai-Bandh) Recruitment rally will be held on 18 June 2018 to 29 July 2018 at Milkha singh Stadium of 1 Training Battalion, 1b EME Centre, Bolarum Secundrabad at 6 AM. 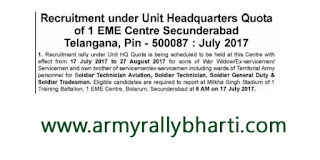 Category to be covered :- Sol Tech, Sol Technician Aviation, Sol Technician, General Duty, Soldier Tradesman. concerned Record as per new format attached. dispensation in case of Scheduled Tribe candidates). (e) Character certificate from School/ College Principal/ Sarpanch/ Ward Master. (Certificate valid for a period of one year). (f) One comprehensive format for affidavit has been formulated as per Appendix. (g) Fifteen copies of latest passport size colored photographs (3.5 cm X 4 cm). (j) NCC Certificate in case of NCC Candidates. (k) Sports Certificate from the concerned authorities if any. 17 years 6 Months to 21 Years for General Duty Soldier.